Here are a few reasons why we're excited about this new product... Design Smaller, More Efficient Systems The compact footprint and low power draw of GF81 allows you to design smaller, more efficient systems. And, with the shortest lay length on the market, installation is easy making GF81 a simple drop-in replacement. 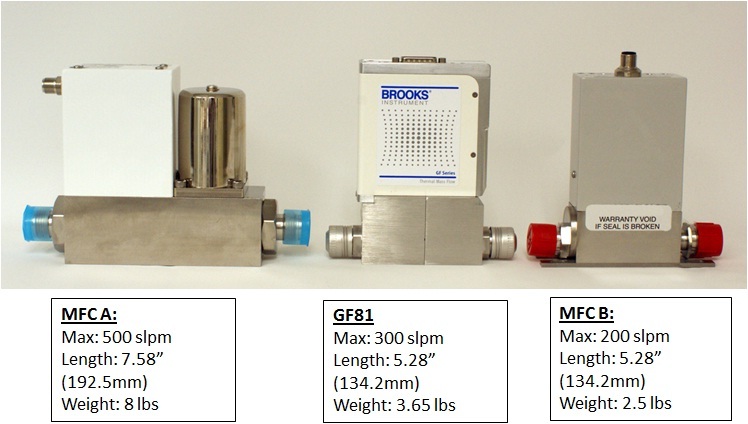 One Product Series for All Your Process Gases Since it's part of our GF40 (elastomer seal) and GF80 (metal seal) Series, the GF81 uses the same high-stability sensor as its low flow siblings, guaranteeing stable, accurate and repeatable mass flow measurement. The all metal seal flow path allows GF81 to handle almost any gas – including many corrosive and hazardous gases. An Ideal Upgrade A wide range of digital and analog I/O options offers the broadest range of communication protocols, making the GF81 an ideal upgrade for existing MFCs or MFMs. Now, you can upgrade to a device that offers better actual process gas accuracy and repeatability over devices that use traditional single-point conversion factors, while keeping the same communication protocols. Want to Learn More? The benefits we listed here are only part of the story. There's more to share about how and why this robust family of devices can be used for a variety of applications. We'd appreciate the opportunity to talk with you so please, post a comment, email us or call (1-888-554-3569) to speak with one of our flow experts.